Only later did the public learn of the high casualty toll and the horrific nature of trench warfare, such as the use of poison gas and the effects of shell shock. 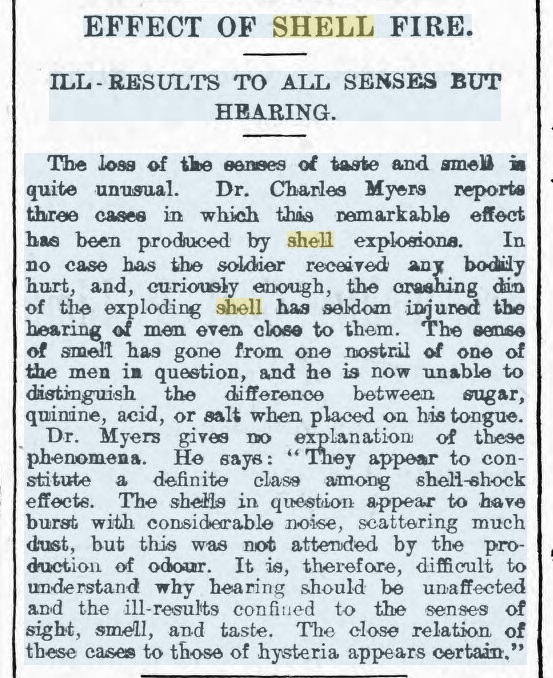 About shell shock I cited an article from the Times of April 1915, only two months after Charles Myers had first publicised the unexpected psychological effects of the War in the Lancet; since then I’ve wondered whether other papers also dealt with the subject early in the War. I’ve spent no more than a few minutes finding these examples. I’m sure that others could be found very easily (and I reckon that early descriptions of shell shock could make someone a nice little thesis topic). This is a good poem and it pre-dates even Myers’s Lancet article, since it was first published in October 1914. It is not based on first-hand experience. (Gibson did not become a soldier until 1916; he tried to enlist earlier, but was turned down because of his eyesight.) Some of his poems, like the frequently anthologised ‘Breakfast’ are based on newspaper articles. Others, and I suspect that this includes ‘The Messages’, were based on conversations with soldiers returning from the Front. ‘The Messages’ was not just a poem for consumption by a literary elite. It first appeared in The Nation, a news magazine with a strong liberal slant and a good circulation (Many years later, when that circulation declined along with Liberalism. the paper merged with the New Statesman.) So this too counts as a way in which the press could raise the subject, when it was a matter of personal anecdote, before it was officially diagnosed by the medics. Can anyone think of more examples? This entry was written by George Simmers and posted on August 2, 2014 at 10:47 am and filed under newspapers, Poetry, Shell-shock. Bookmark the permalink. Follow any comments here with the RSS feed for this post. Post a comment or leave a trackback: Trackback URL. I heartily agree with you! I have spent ages in the newspaper archives for my upcoming book Shell Shocked Britain and it is VERY clear that few could have escaped the knowledge of the horrors of trench warfare. Young men were returning home in their thousands physically and mentally wounded and despite censorship news reports, even in the very local press, were filled with individual tragedies and expert comment. One of those myths that I hope the next 4+ years will put to bed. As we can testify, for we are there. suggests something like shell-shock as one reason for desertion. I have always been a little surprised how early in the war Gibson was using the term “Back from the trenches”. It tends to get lost in the mass of later poems and general memory quite how new the situation must have been at the time. He wrote this and “Breakfast” within weeks of any trench line being established (unless perhaps he was thinking of the defence of Antwerp, where his friend Brooke would have been). “Shell shock” was the commonly used term for many years during the First World War” and long afterwards for decades. Modern-days’ simpering euphemism, “Post-Traumatic Stress Disorder” avoids the lasting mental wounds suffered by soldiers who had endured massive artillery bombardments and horrific battlefield carnage in general. After the end of WWOne, the British government provided no special health-care treatment to the likely millions of shell-shocked soldiers after after they returned to civilian life. They were simply left to fend for themselves, and just “soldiered on” with the quiet private resilience that was typical of their generation. Post-Traumatic Stress Disorder is a medical diagnosis and hardly a “simpering euphemism.” Unlike “shell shock,” it includes comparable reactions to civilian disasters. In fact, “neurasthenia” was the usual (and very vague) name for PTSD symptoms in the later nineteenth century. The original and far older near-synonym was “nostalgia,” whose modern sense of that word had not fully developed. The Union army issued over 5000 discharges for “nostalgia” during 1861-65, at a time when malingering was the preferred “diagnosis” for most non-physical complaints. Sorry to have misread my notes: there were about 5,200 “nostalgia” diagnoses (not, as I wrote, discharges) made by Union army physicians during the Civil War. But the cases must have been severe to have been diagnosed at all. The percentage caused directly by combat stress is probably unknowable. 1. Acute longing for familiar surroundings, esp. regarded as a medical condition; homesickness. Also in extended use. 1756 tr. J. G. Keyssler Trav. I. 141 At least it is thus Scheuchzer endeavours to vindicate the nostalgia, pathopatridalgia, or the heimweh, i. e. home-sickness, with which those of Bern are especially afflicted. 1770 J. Banks Jrnl. 3 Sept. (1962) II. 145 The greatest part of them [sc. the ship’s company] were now pretty far gone with the longing for home which the Physicians have gone so far as to esteem a disease under the name of Nostalgia. So maybe your American soldiers were just melancholy because they were away from home? Which would be understandable. Or maybe it’s just that mental problems are interpreted differently in different times. But perhaps American dictionaries have a different meaning for nostalgia? Swiss medical student Johannes Hofer coined the word “nostalgia” (from the Greek nostos ‘return home’ and algos ‘pain’) in 1688. As he was writing in German, the OED apparently did not notice the word so early. The 1770 example shows that harmless fond yearnings were not what was meant. Apparently Hofer had read an account of what today we’d call “depression,” “anxiety,” and “emotional disturbance” among Swiss mercenaries abroad. Without insisting that such difficulties were restricted (like “shell shock”) to combat veterans, Hofer theorized that the natural, physical “humors” were badly imbalanced by separation from one’s homeland. He thought of “nostalgia” as a potentially debilitating, even fatal, illness rather than simple “homesickness” (a later word in English, translated from German “Heimweh,” which Germanized “nostalgia”; the original element of “pain” or “sickness” appears in all three words). The connection of “nostalgia” to “shell shock” is that both were first identified in soldiers and attributed to physical and/or emotional wartime trauma. Both covered, albeit imperfectly, some of the same conditions. The meaning of nostalgia, however, gradually weakened into something bittersweet; use of “shell shock” declined because it could misleadingly suggest an instantaneous onset or simple concussive origin in most sufferers. I believe that Dr. Meyers’s description of shell shock was less a new medical “discovery” than a revelation of its unprecedented incidence and possible severity, even among fine moral and physical “specimens” of manhood.